Fructis' new 3-minute mask combines a Rich Damage Repairing Mask with Amla Extract and a Care Sealer treatment, to help with dry, damaged hair until your 4th wash.
1. After shampooing with Damage Eraser Shampoo, apply the Rich Damage Repairing Mask on wet hair. 4. On top of the Rich Damage Repairing Mask, apply the Care Sealer directly on the lengths and ends. 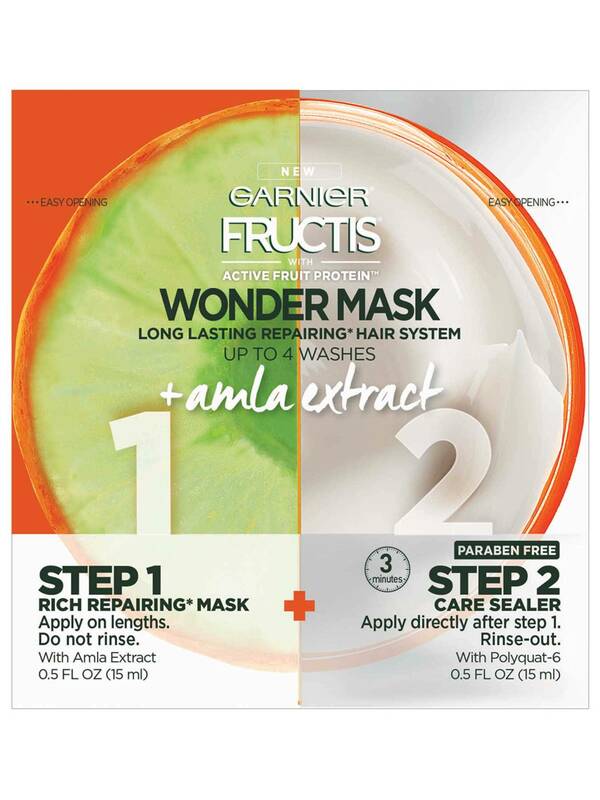 Rated 5 out of 5 by Wizardtreats from The Wonder Mask The Wonder Mask & Amla Extract Hair Mask by Garnier Fructis has actually sucessfully done wonders for me during this winter! My skin and hair are usually suffering, damaged and dry due to the harsh weather and this hair mask has helped transformed my sad locks into sassy yet extremely soft, manageable, commerical-approved hair leaving it smelling like a delicious tropical drink. This mask is silky smooth and creamy and the scent is so mesmerizing! I truly enjoyed using this product from start to finish and results certainly last for the 4 days as the package claims. It was like being at a salon at home.This scent was intoxicating and I felt like a delicious tropical drink waiting by a pool afterwards. I highly recommend this to someone that wants to give their hair that extra love it deserves! Husband approved! Definitely will purchase! Rated 5 out of 5 by fsnohio8 from Miracle Worker! 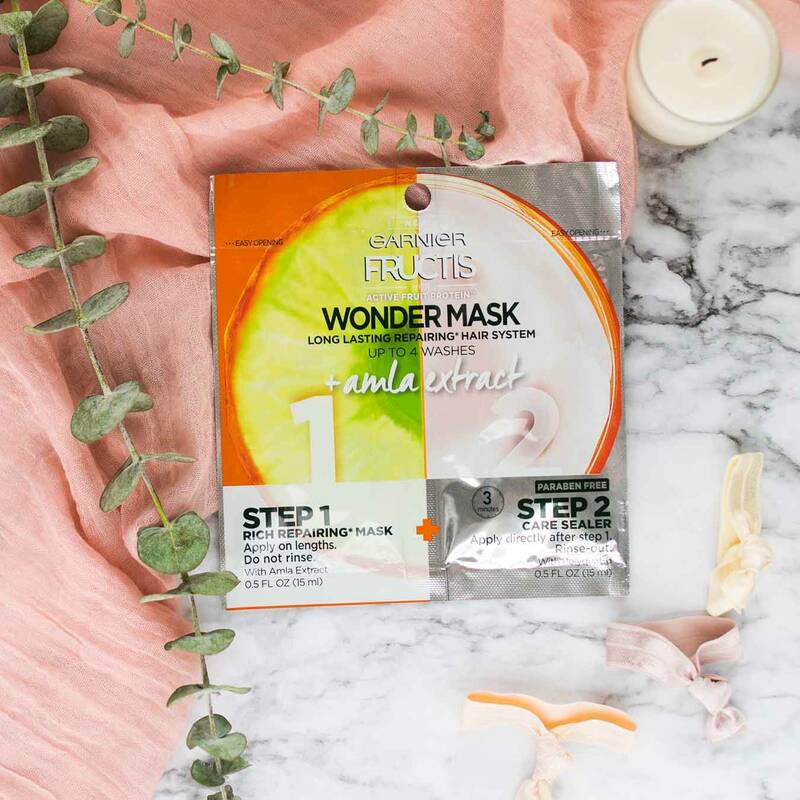 The Wonder Mask + Amla Extract Hair Mask by Garnier Fructis has been a miracle worker this winter helping my dry, damaged, and frizzy hair to become extremely soft and manageable. Unlike other leave-in hair masks, this one did not weigh my hair down at all or leave it greasy feeling, it added the perfect amount of moisture and the results truly did last for 4 days like the package claims! As an added bonus, the fruity smell is amazing and the price is great for such a quality product. I highly recommend this for anyone wanting to give their hair some TLC! Rated 4 out of 5 by angel2celestial from Nice conditioner! 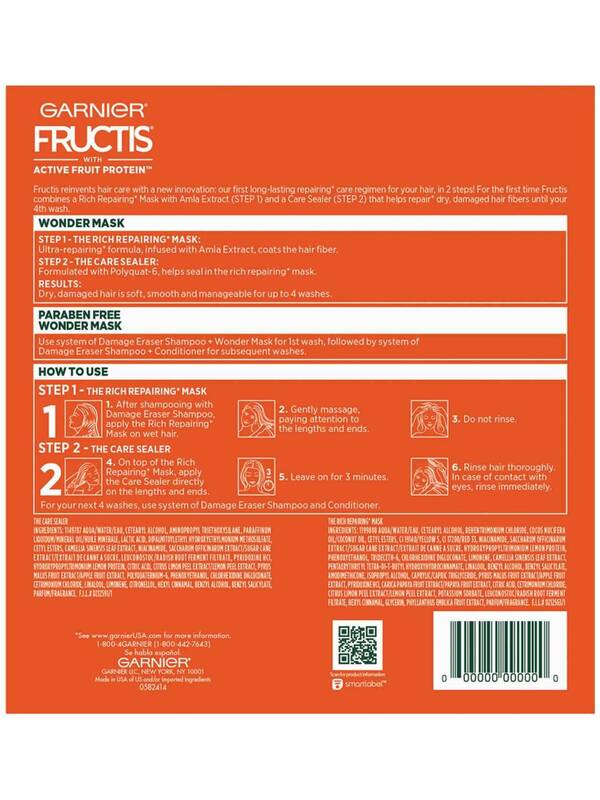 I really loved the scent of the Garnier Fructis Wondermask + Amla Extract conditioner! The scent stayed in my hair for a couple of days even after washing it a few more times and it definitely felt nourished even after the one use. Rated 5 out of 5 by TTaylor88 from Silky smooth hair I think this mask is perfect if your hair is is in need of some major TCL. I suffer from fine, dry and damaged hair and this worked wonders for me. Ive tried other products but this mask is super affordable and amazing!I love the fruity smell of it and not to mention how soft it left my hair. I used this mask twice over a 4 week period and my hair has not looked this healthy in years. I would definitely recommend if your needing some hair repair!! Rated 5 out of 5 by jocelynjp from So nourishing! I have thin hair so I was able to get 2 tries out of this and I loved it! I mean just the smell is intoxicating! It smells so so good but it also nourishes and moisturizes amazingly. I always have issues with tangles after the shower but that didn't happen with this mask! I can't believe I didn't even need to use conditioner right after. I am thinking of doing this every 5 washed to keep my blonde baylage alive and vibrant. Highly recommend! Rated 4 out of 5 by LauraRoselia from Such a good hair mask! My hair is naturally thick, coarse, and dry, and on top of that I also bleach and dye my hair. So it's very safe to say that my hair has gone through a lot and requires tons of love and care. When I saw this product I was immediately intrigued that it was a 2 step process. The first step is the mask, after shampooing I applied this from a few inches off my roots to the ends of my hair. I have very long hair but was able to saturate my hair with the mask with the product provided. Next, I applied the second step which is the "Mask Sealer", I applied this to the same spots that I had applied the mask to. The packaging instructs to leave the mask for about 3 minutes, I left mine on for a little over 5. After washing out the mask, I could feel that even wet my hair was feeling smoother and stronger. I could really see the results after drying my hair, my hair felt pretty strong and soft. The product claimed that the mask would be sealed in for at least 4 washes, I was surprised when I did find my hair still quite soft after the second and third. I'm not sure it did last much more past the third, but I was still quite impressed with the fact that the results remained even past the first wash. Overall, I have to say I am happy with this product, it is pretty inexpensive and provides good results. I would use this mask again and use it periodically to give my hair an extra boost. I recommend this product to anyone who would like to give some extra tlc to their hair!